Short take - Nice one DC Comics, with Suicide Squad you've now made the two most unwatchable films of the year. And you've hired the same team to make the sequel in what I can only assume is a conceptual art installation of irony. Let's cut the crap and just take a hundred million dollars and burn it on the sidewalk outside the Mann Chinese Theatre. At least we could get the side benefit of toasting some marshmallows. Just back away from the movie camera. Now. Considered review - SUICIDE SQUAD comes on the heels of DC Comics attempts to establish a movie franchise analogous to Marvel's, where individual character movies alternate with ensemble pieces, each of which adds to the greater mythos. The relaunch began with this year's dull-as-dishwater BATMAN VS SUPERMAN flop, and continues its disastrous run with this new ensemble piece. The plot picks up from BvS with a world mourning the death of Superman and wary of the rise of "metahumans". Accordingly, a government official decides to band together a bunch of both super-creatures and just insane people, and offer them time off their sentences if they'll help keep America safe. But, in the manner of Nolan's Batman films, and basically every other superhero movie, supply creates its own demand, and the very people meant to make America safe contain within their host, one who'll destroy the earth. What we should get from all this is a kind of DEADPOOL meets THE AVENGERS in which its the bad guys who band together to hunt down other bad guys. The greater tragedy is that we know that director David Ayer is good from gritty urban thrillers like END OF WATCH and the nonpareil World War Two tank battle movie FURY. You get the feeling watching SUICIDE SQUAD that he was trying to make a truly sick, dark, subversive movie set in a permanently gloomy messed up world. The cinematography and aesthetic speak to his back catalogue - trying to expose the grimy nastiness of life and morally conflicted characters. But then, if we are to believe the press, DEADPOOL happened, and the studio decided to make the movie funny. So we got reshoots and a re-edit that tried to make the movie post-modern and ironic and snarky. You can literally see where these moments of dialogue have been shoved into the film, so jarring are they with the background tone of mean nastiness. And most involve Will Smith being Will Smith, rather than his, you know, actual character, the assassin Deadshot. A few others involve Margot Robbie's psychiatrist turned psycho, Harley Quinn, who is reduced to a super-sexed up doll swinging a baseball bat, striking a pose and slinging out a one-liner. Few hit the mark. DEADPOOL worked for three reasons. First off, it was R rated which meant that the zany comedy could really hit below the belt, and the dark mean-ness could be truly nasty. 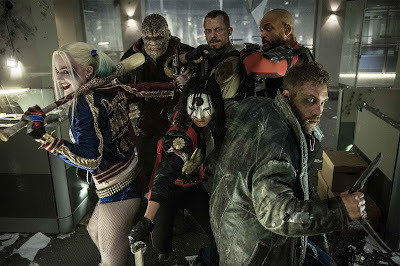 By contrast, SUICIDE SQUAD is massively hampered by its PG-13 rating. The characters are meant to be the baddest of the bad but we never really see them acting that way. The second reason DEADPOOL worked was that, at its heart, it was a love story, and the audience had characters to root for. There's none of that here. We're meant to like Deadshot because, aw, he just wants custody of his kid. But we don't spend enough time with them to engage with the relationship. Ditto Harley Quinn. I'm guessing there's actually a really fascinating obsessive love story to be mined in her interaction with the Joker. In an all- too abbreviated set of flashbacks we learn that she was assigned to council the Joker (Jared Leto) when he was in prison but fell for him. But I can't engage with that when I've seen them on screen for a few minutes and interacting in a stylised manner reminiscent of a music video. In fact, this Joker is the worst we've ever seen - neither funny nor scary. And there's the weakest of the relationships - between the Navy SEAL (Joel Kinnaman) and the archeologist turned Enchantress (Cara Delevigne). With the Enchantress being the Big Bad and the army guy being in charge of the Suicide Squad sent to stop her, you might have thought it would be worth establishing this conflicted and dangerous relationship. But no, all we see is the real Big Bad, Viola Davis' government official, Amanda Waller, setting them up to fall in love, which they do, thirty seconds later. The whole thing left me feeling short-changed. And this brings me to the final point. DEADPOOL worked because it wasn't too crowded with characters. In fact, that movie actually winks at the screen and laughs at how few X-MEN are actually around to help him out. And when you look at successful ensemble movies they either establish their characters in standalone movies before bringing them together (AVENGERS) or cap themselves at four or five (GUARDIANS OF THE GALAXY). By contrast, SUICIDE SQUAD needs us to get to know 10 or more new characters. No wonder none of them have room to breathe. And in an act of lazy writing, guess which one's gonna die in the first five minutes of the action sequence? Maybe the one they didn't bother giving us a back-story to?! And poor Karen Fukuhara as Katana is very ill served by having no backstory. All in all, this movie is just mindless violence with two many characters, none of whom I care about. It's neither funny enough nor dark enough to be memorable. So, after this and BATMAN VS SUPERMAN - I am OUT of the DC universe. They don't get another dime from me. SUICIDE SQUAD has a running time of 123 minutes and is rated PG-13. It is on global release.